As I have mentioned in earlier blogs I am a member of Influenster. I receive products from them for free for testing purposes. However, the thoughts and opinions are my own. 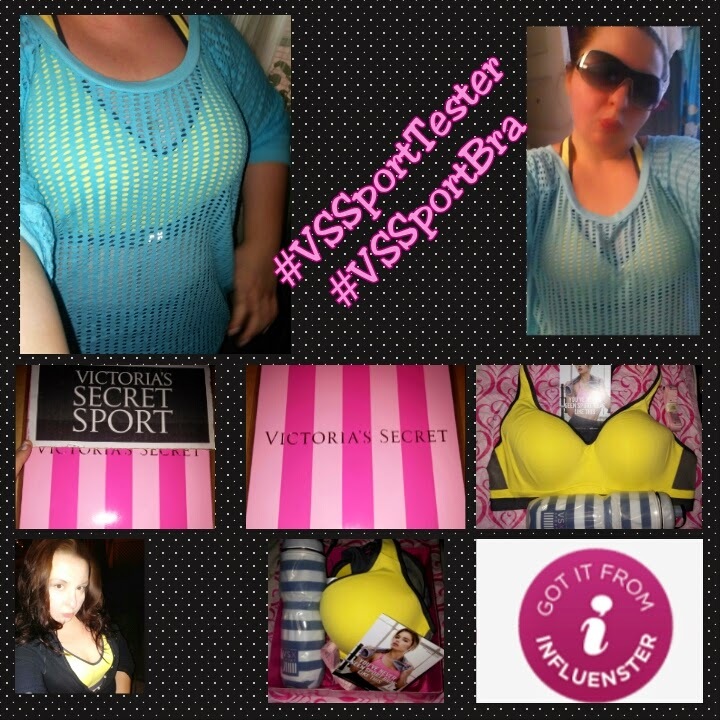 My latest Voxbox from Influenster was the #VSSportBra box. Yes Im a #VSSportTester and I got to test out a new Victoria Secret Sport bra. Before this I had been familiar with their Sport line but didn't have any of their bras. For workouts Id wear a Victoria Secret bra and a sport bra over to keep the girls from jumping out. Not the view Id wanna give the guys at the gym. Thanks to this trial I got to test the "INCREDIBLE" Sport bra. So whats so great about the bra you may ask? Now after reading that your thinking so how did it do? I have already wore it three times to work out. Once was hiking, once for yoga, and the last, the real test running. I have to say during yoga I was able to move without fear of falling out and the back stayed put. It didn't roll up like some bras do. Now what about the run? I was able to jog and also run at full speed without falling out of the bra. I also didn't have that "The girls are going to hit me in the face" feel like some bras have. Plus the material left me feeling drier and cooler. Not sticky and stuck to my body. In all this was an amazing product and I cant wait to get another bra. Maybe the Knockout Sports bra next. This is a sponsored blog post. Influenster provided me with complimentary Victoria's Secret products to test and review as part of a contest! Now I wanna save all my Divas time and money so I'm going to let you in on the companies I get free products from. Now it's not gonna cost you money but it may cost you a little time. Most companies send me free products to test however I do have to usually fill out a survey or write a short review. But it's not hard and all it cost nothing. Plus a lot of sites you can get to on a smartphone. So when you are at dentist waiting on your child or at their soccer practice. You can do the survey. The companies I've worked with, or have tried are Vocal Point, Smiley 360, Influenster, Crowdtap, Buzzagent, and She Speaks. Now I have only been with most of these companies three months or less. Vocalpoint.com- I have been with them a couple of months. I have responded to a couple of topics just to get a feel about the company. So far I've received two different promos. I have gotten a couple of boxes of root touch up hair color. And I was able to try and received before it came out 2 full size products of the new Secret Clinical Strength deodorants. Since I wrote this blog I have not received any free products. However, I did join Orgullosa, which is a Latino based version. More details after I work with them. Smiley360.com- I have been offered a couple of promos with them that I didn't accept. Due to them being a topic I wasn't that familiar with. But the two that I did so far were for Greenies dental chews for dogs and Airborne gummys. Both were full size products! I do get a lot of surveys to be a tester but it was things I don't use, cold sore meds and hemorrhoid wipes. I did recently get one for soap that I was able to join in. Smiley also throws Twitter parties so if you join they will give you the info to those. Influenster.com- So far I have to say I'm not sure I'm doing this site correctly. I've earned the badges, which means doing surveys and reviews. However, I haven't qualified for a box. I also have done four Twitter parties and didn't qualify with that either. So when I wrote this blog 6mths ago I wasn't sure how I felt about recommending them. However, after reading a comment from a member I found out you have to review products and answer questions about the products before you get a box. So that great Revlon lipstick you like, that new shampoo you got or maybe a healthy snack you buy, write a short review about it. The higher my badges got the more boxes I got. Im on my 4th since Jan and it was a brand new Victoria Secret Sport bra to test. Not all boxes are that big but all contain little goodies geared toward what you said on your surveys. Crowdtap.com- It does involve a lot of time on their site "tapping", sending pictures of items and joining in discussions. But every month you can earn gift cards. In the three months I was with them I product tested two foods and won 3 gift cards of $5 each! Since then I haven't done any product tests because I have not been chosen but have gotten a few more gift cards. The best being a $10 Sephora card. Also I won at one of their Twitter parties 5 bottles of body wash and a $25 gift card. I actually recommend getting Klout as I stated in other blogs! It's free and so far I've earned 5 perks. Two bottles of Vita Frute, Real techniques makeup brushes, Blowfish for hangovers, Freeman facial masks, a People magazine Vip box and subscription, and Ricola. And with Klout all you do is sign up your social media accounts. No surveys or anything! Hopefully this will save my Divas some time and you will earn some free stuff for yourself.